Home » (in)courage » Oh Happy (#AMomentToBreathe Book Release) Day! 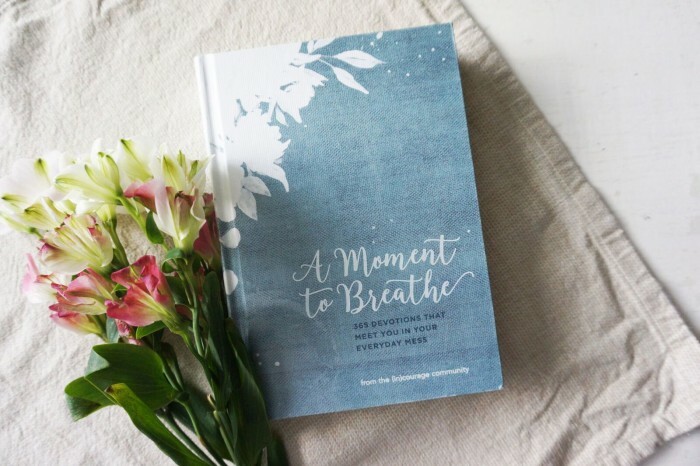 Oh Happy (#AMomentToBreathe Book Release) Day! If you aren’t yet a subscriber, how about today? Our world is reeling these days, isn’t it? Collectively, we feel the tragic news out of Las Vegas, horrified that one man could rob so many of so much; for too many, their lives. I can only imagine that those who are directly affected wonder how anyone can go on in a world gone mad? There’s no reconciling the absurd. There are times when faith comes easy. This isn’t one of them for a lot of folks. I know all the Christian platitudes, the things we say at times like this. But I can’t bring myself to say any of those things out loud – even if they are true – because sometimes the loudest lament is silence. God hears the cry of the broken ones, and he alone offers hope during obsidian days. So, we mourn with those who mourn. We ask a lot of questions. Yes, we want answers, but the truth is we’ll never be able to make sense of it. This world we find ourselves in is still spinning, sun and moon nudging us into the next day and the one after that. And, here’s the important thing to remember: even in the darkness there are beacons. We need light to guide us to where we are going, yes? We need light to show us the way. Months ago (a year ago?) the date was set for A Moment to Breathe to release. No one could have anticipated the timing, that this collection of “365 devotions to meet you in your everyday mess” would launch right after the deadliest mass shooting in our nation’s history. Eighty authors, inspired by scripture and for the glory of God, poured their hearts and lives into its pages, hoping it would bring light into the lives of those hopeful or desperate to find a beacon. I’m proud of this book, thrilled and honored to have seven devotions included. There’s a part of me that feels guilty for being happy when so many of our neighbors have suffered unimaginable loss – before Las Vegas, the multiple earthquakes in Mexico, hurricanes Harvey, Irma, and Maria, and those awful west coast wildfires. Unresolved racial tensions and political discord add to our collective grief. And beyond these national tragedies and disasters are countless more personal tragedies and disasters. Every day our neighbors are facing financial ruin, infidelity, addiction, illness, difficulty with children, debilitating accident, death…. Maybe you are the neighbor. Here’s the beautiful, liberating thing: humans are a complex and multi-dimensional creation, capable of simultaneous, opposing emotions. (Laughter through tears is my favorite emotion.) In other words, the “guilt” I’m feeling is a false guilt, the kind the enemy of my heart loves because it has the potential to defeat, paralyze, or confuse me (sometimes all three). False guilt materializes in a thousand different ways, and often it’s rooted in comparison; for me, at least. With all tenderness for those who are suffering, I can still celebrate the happy and good things happening in my world (if you need permission, I’m extending it to you, too, because sometimes we just need someone else to tell us so). It doesn’t have to be one or the other. It’s essential to have compassion for those in pain, to pray for, help and support those who’ve suffered loss. It’s also important be light for those walking in darkness (Matthew 5:16). A Moment to Breathe is a disco ball of light. Oh Robin, the Lord does all things perfect…and this new devotional will be just what someone needs in these dark days. 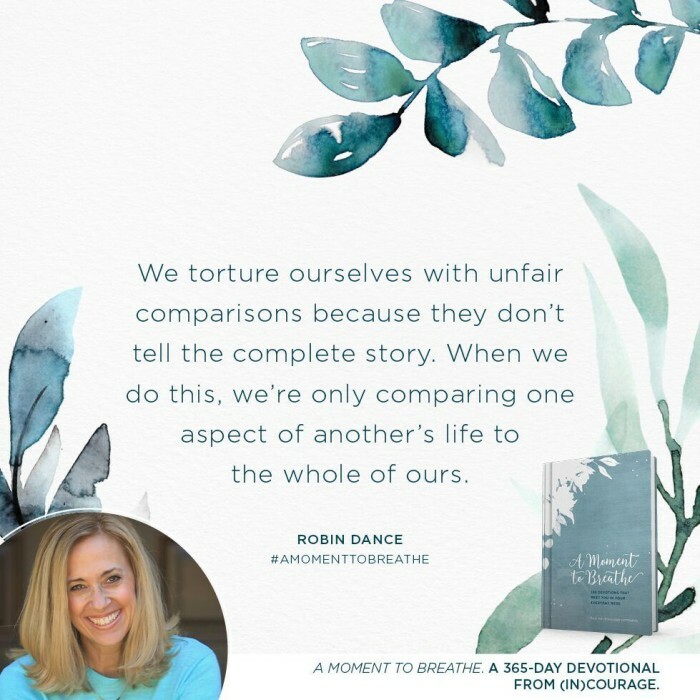 Your words are truth about mourning with those who mourn, and also being happy with those who are happy… We continue to add to our prayer lists one wave of disaster after disaster…I myself need these devotionals day after hard day, and can’t wait to pick this one up! God bless you as you encourage us all! I love this love note, and I love you and your heart.